Students participate in a sit-in demonstration at Cherry Hill East High School on Monday morning. 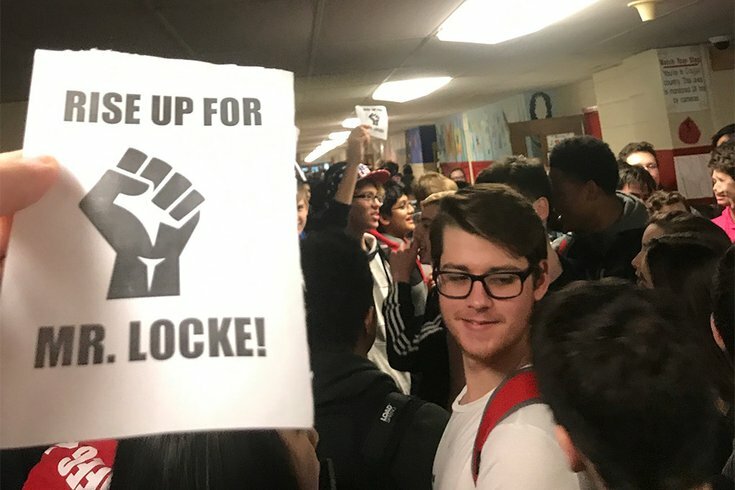 Students organized the protest in the hallways to support teacher Timothy Locke, who was suspended last week after raising concerns about security at the school in wake of the shooting at a Parkland, Florida high school. In response to the Florida school shooting that left 17 people dead, high school students across the country have been participating in protests and have planned a massive, nationwide walkout. The demonstrations are a call for change to gun laws and school security policies from students who say they don't feel safe in the classroom. Some students, however, have been warned they will face disciplinary action if they participate in the scheduled March 14 walkout and other smaller but related demonstrations. That includes Cherry Hill High School East. During Monday morning's announcements, Cherry Hill East Principal Dennis Perry said students who wished to have their voices heard about security at the high school could meet with him in the auditorium immediately after the announcements. Perry said anyone who participated in any sort of "planned disruption" would be suspended. A sit-in demonstration at the intersection of the school's two main hallways had been organized by students for Monday morning and was already taking place when Perry made the announcement. "I am assuming that the purpose of the planned disruption was out of frustration because it was felt as though you were not being heard," Perry said in audio obtained by PhillyVoice. "Well, I do want you to have that opportunity to be heard, and I do want to hear you." "Please know that those of you who opt into some sort of civil disobedience will be immediately suspended and you will lose your senior trip and prom, if you are in 12th grade," Perry said. The protest was organized in support of teacher Timothy Locke, who was suspended last week after he raised concerns about security at the school in wake of the shooting at Marjory Stoneman Douglas High School in Parkland, Florida. Other school districts across the country have taken similar actions. Curtis Rhodes, superintendent of the Needville school district in Texas, wrote in a since-deleted Facebook post that any student who participated in the nationwide walkout would face suspension. "Life is all about choices and every choice has a consequence whether it be positive or negative. We will discipline no matter if it is one, fifty, or five hundred students involved," Rhodes wrote, according to KOCO5. A school district in Wisconsin issued a statement saying participating in the walkout would be considered political activity, which isn't protected under district policy. A South Carolina district specifically asked students not to participate. While some high school students may face immediate consequences for their actions, they likely won't be penalized by the colleges they apply to attend after graduation. Numerous U.S. universities have issued statements saying a student won't hurt his or her chances of admission by walking out in one of these demonstations; MIT, Brown and Yale are among the colleges that have issued assurances to potential students. Some colleges in Philadelphia and the surrounding area have done the same. On Sunday, Temple said in a tweet that admission decisions won't be affected by a student receiving disciplinary action for participating in a peaceful protest. From our Student Conduct Code: Temple’s “tradition of passionate discourse is a time-honored one, and remains critical to this day.” As such, future Owls should know admissions decisions are not affected by disciplinary action resulting from participation in peaceful protests. Our founder, Benjamin Franklin, was a great believer in democratic principles. He also believed strongly that the aim of education is service to society, and peaceful protest is one of the highest forms of service in a democratic society. Penn applauds any student who peacefully asserts their right to protest, whether for tighter gun regulations or for other causes that they believe in. Participation in these activities will not negatively affect any student’s application to the University of Pennsylvania. We want to reassure students who have applied or have been admitted to @RutgersU that disciplinary actions associated with participation in peaceful protests will not jeopardize your admission. If you're concerned about being penalized by Lehigh as a result of being suspended for your peaceful protest of gun violence, have no fear! We won't hold it against you.